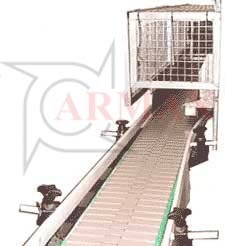 Slat conveyors are predominantly used, and are ideal in such industries as food and pharmaceuticals (please see below OR to the left for restaurant conveyors), where rapid speed and accuracy is of utmost importance, plus they also have the ability to be washed down for hygiene purposes. Their construction is either an acetal or stainless steel slat, side flexing for bend sections - The most widely used in the food industry is acetal. The advantage of using slats, is that the can open up slightly around a bend therefore a very tight radius can be achieved - Usually 2.5 times the width (as a rule of thumb). As mentioned above, the slats are usually manufactured from acetal (a hard heat resistant plastic) or stainless steel and range from a width of 200mm to 500mm. Because of their width, they will usually be mounted on a tripod support stand with floor levelling adjustability, and come complete with adjustable side guides, and, because of the low friction, can be ideal for the accumulation of products awaiting to enter machines such as labellers and packaging machines. As a general rule for layouts, because of the side flexing walls on some slat conveyors, the radius will be approximately two and a half times the slat width.